It turns out that you don't have to be a brown and grey military shooter to sell well. Andy Wilson, design director for Codemasters' upcoming shooter, Bodycount, said her was pleased that Bulletstorm as it showed that consumers would actually buy shooters that weren't Call of Duty or its contemporaries. Wilson said that Bulletstorm's success showed that there was room in the market for all kinds of titles, and said that it was nice that it was possible to make a multi-million selling shooter that wasn't a big-name military FPS like Battlefield or Medal of Honor. "We looked at Bulletstorm and I think it's fair to say that it was a sort of 'acid test' for us," he said. "Because they were coming out first we were very interested in how they did and it's a very good sign." 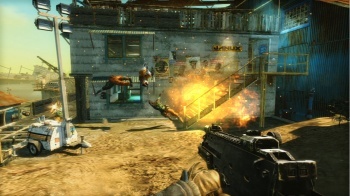 Bodycount is said to be a spiritual successor to the 2006 FPS Black, which was created by the same team. While it's not necessarily all that much like Bulletstorm in terms of gameplay - you're not going to score extra points for groin shots, for example - both games have the distinction of being new IPs competing in a market dominated by just a handful of large franchises. It's worth mentioning, however, that Bulletstorm had a number of advantages that Bodycount lacks. For starters, Epic's marketing budget seems to have been significantly higher; the studio actually released an entire parody game as part of the marketing campaign. What's more, Epic could offer access to the Gears of War 3 beta as an incentive, something that Codemasters obviously can't do. Wilson isn't wrong that there's a market for non-military, non-brown shooters, but selling millions and millions of copies take a lot of effort. Whether Codemasters has pushed hard enough will become clear when then game comes out on August 30th.